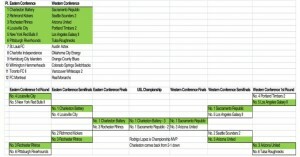 Last week I was challenged to put my mettle to the test in the first-ever USL Expert Challenge. The Rules are pretty straight forward, you have to guess the final positions of each of the 24 teams, as well as the playoff winners and the final score of the championship game. Below are selections, as well as a few prop bets. – I only briefly looked at the standings when compiling my rankings and didn’t use any stats. – I felt the Western Conference was a lot harder to pick than the Eastern Conference, mainly because of the numerous MLS-owned sides in the West as opposed to the East. 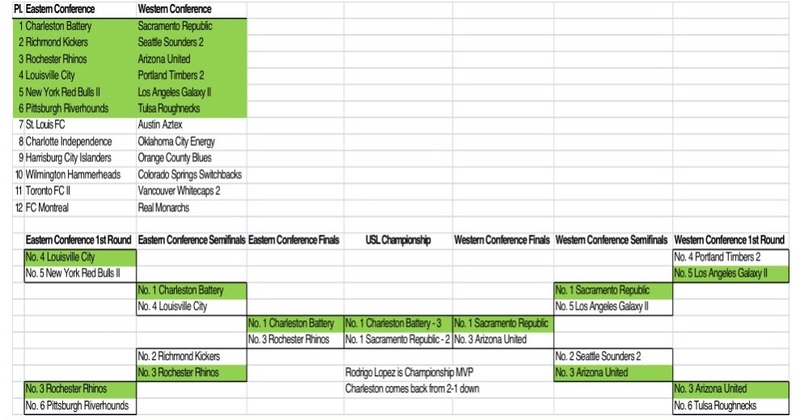 – In full disclosure, I owned OKC Energy season tickets last year, but have them outside the top six in the West. They were prone to streakiness last season, and that’s why I don’t like their chances. – Charleston Battery wins it on the back of their sheer resilience early in the season. – If I was a coward I would strongly consider flipping both my sixth and seventh place teams in both conferences because I think they’re that close. Who do you think I picked correctly, and who do you think deserves to be placed higher or lower than what I have them positioned? Let me know in the comments, or feel free to call me a moron on Twitter. Either is fine by me.